If you need to tweet more than 140 characters, then you should check out TwitPlus’s universal download. For $.99, you can add depth and breadth to your micro-blogging experience. A feature you will appreciate about TwitPlus is the sync to Twitter. When you touch the icon on your iPhone or iPad for the first time, you are directed to Twitter to allow TwitPlus to access your account. With this set-up, TwitPlus does not house your Twitter password. And, if you’re an iPhone and iPad app lover, you know how many times you have created a user name and password. It’s refreshing to have functionality without the process of setting up an account. The TwitPlus iPhone and iPad app has a Twitter-esque graphic sensibility, but with a bit more tongue-in-cheek humor. The blue bird logo reminds me of the goofy bird character in a cute, cool children’s book. If you think about what Twitter’s graphics would look like with an edge and attitude, then you’ll find it in your TwitPlus iPhone and iPad app. It is simple to create your tweet in TwitPlus. You type into the keypad, hit done, and touch tweet. Your tweet instantly appears in your Twitter feed and your TwitPlus feed. When you look at a tweet generated by TwitPlus in Twitter, you see the first part of your verbose tweet and the link back to TwitPlus. The TwitPlus iPhone and iPad app generates the link for you. You don’t have to take extra steps to develop a link, as with other link shortening tools and applications. To look at your TwitPlus tweet history, you access them with one touch from the home screen. One of the neat features of TwitPlus is the tally of clicks in your TwitPlus history. You don’t have to go to another website or application to track the clicks on your shortened links. TwitPlus’s app for iPhone and iPad is a quick, easy, visually interesting, and effective tool for creating tweets greater than 140 characters. 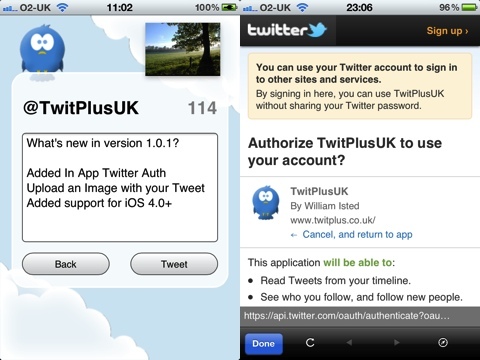 AppSafari review of TwitPlus was written by Jenni Ward on January 19th, 2012 and categorized under App Store, iPad apps, Social, Universal, Utilities. Page viewed 4343 times, 1 so far today. Need help on using these apps? Please read the Help Page.